Have you been looking for a more bouncy alternative to memory foam? Do you want your next bed to be more organic? 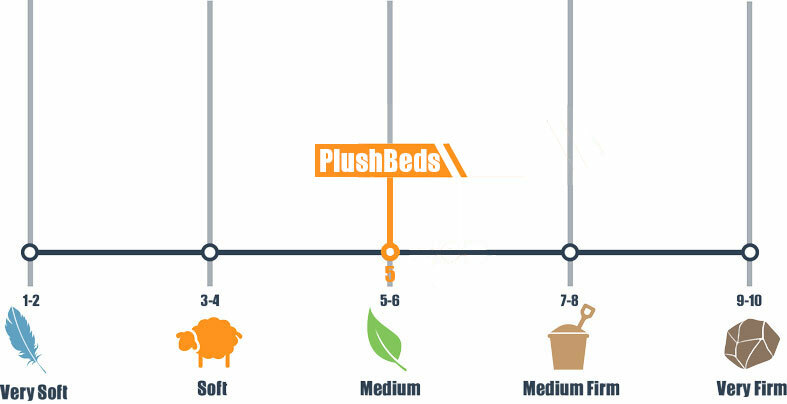 PlushBeds believes they can offer the healthiest and most comfortable mattresses on the planet because of their dedication to sourcing only the highest-quality organic materials and they are constantly innovating to provide the best fit for individual sleep needs. 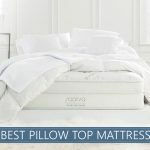 Our in-depth review of PlushBeds Botanical Bliss, which is part of the company’s natural latex line, will walk you through all the certifications and special features that make this product stand out, including support, responsiveness, cooling, and bounce. This model is available in three different firmness levels: Soft, Medium, and Medium-Firm. You may also choose your preferred thickness: 9 inches, 10 inches, or 12 inches. This review is focused on the Medium 10-inch mattress, which should be the most versatile and accommodative. Leave no stone unturned with our deep analysis or plunge ahead and get right to the score and summary. Want bounce – These quick-responding latex layers have a lot of bounce both at the surface and base level that helps with repositioning, so you should not ever feel like you are stuck. Unlike some innerspring beds, this bounce remains localized and should not disturb your partner. Prefer an eco-friendly mattress – This product has received environmental certifications, such as OEKO-TEX® and GREENGUARD Gold, which means the materials have been rigorously tested for harmful levels of dangerous chemicals. The cotton, wool, and latex meet global third-party standards for organic materials. Sleep hot – Latex does a great job resisting body heat, and PlushBeds has aerated the layers in this model for even more airflow. They have also included a breathable cotton cover and layer of wool that wick away moisture. Are on a tight budget – This mattress was built with a lot of premium natural materials, including certified organic latex, cotton, and wool, and it costs substantially less than comparable beds in the retail space that have this amount of natural materials. PlushBeds’ latex line does include the Natural Bliss and the Eco Bliss if you are looking for a slightly lower price point. You can see our list of top rated budget beds here. Botanical Bliss is a latex bed-in-a-box that is built to order and delivered to your door from the company’s factory in California. The King and California King sizes may arrive in two separate boxes due to weight restrictions and require some assemblage. Because of the mattress’ weight, the company strongly recommends only stable, flat surfaces, like platforms or slatted frames, with no more than 2 inches between the slats. This bed’s elasticity is suitable for adjustable frames, and you can order sizes Queen and above split so that each side may adjust independently or be customized to different firmness levels. The cover is made from GOTS certified organic cotton and wool. This material is circular knit for added elasticity and breathability, while the wool helps to cushion the surface and wick away moisture. 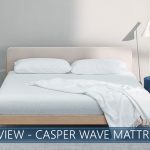 This review is for the 10-inch Medium mattress, but there are different comfort levels and thicknesses available that will change up the dimensions, layering, and specifications. The first layer is a Medium 3-inch Arpico Dunlop Latex, a material that was designed to gently contour the sleeper and foster pressure relief. The immediate response and bounce ease repositioning, and the material is naturally resistant to mold, mildew, and dust mites. Arpico is one of the world’s leading providers of all-natural latex. The second layer is 3 inches of this same Dunlop Latex, though it is slightly more dense with a Medium-Firm feel. The final layer is 3 more inches of an even denser Dunlop Latex. This Firm foundation provides great support as the body sinks into the deeper layers. On our firmness scale that scores mattresses between 1 and 10, with 10 being the firmest, the 10-inch Medium Botanical Bliss scored right in the center at a 5. A mid-range firmness tends to be the most popular because of its versatility and ability to accommodate different sleep styles. If you prefer something softer or firmer, this model is available in two other comfort levels: Soft and Medium-Firm. The cotton knit cover is soft to the touch and just pressing on mattress’ surface, you immediately feel the Dunlop’s springiness beneath the wool layer. Climbing into the bed, you will notice how plush and quick-responding the comfort layer is and how it conforms to your curves without hugging you tight like traditional memory materials can. Because you sleep closer to the surface, more of your body is exposed to the air, which helps keep you cool while sleeping on the bed. The naturally breathable foams have also been aerated and topped with breathable cotton and wool to wick away moisture and promote temperature-regulating airflow. Back sleepers will feel the comfort layer conform to and support their lumbar region while the supportive base layer works on holding their spine straight. Why is that important for them? Find out more about sleeping on back here. Most side sleepers, who commonly develop the most pressure points because they sleep with their weight concentrated on a smaller surface area, will enjoy how the comfort layer conforms to their curves and relieves pressure (find out how the mattress type affect side sleepers here). Stomach sleepers need a bed with good support to keep their hips from sinking too low and holding their spine at an awkward angle. Most should be comfortably supported by the Medium, but those needing extra support, especially those with heavier midsections, may find the Medium-Firm is a better fit (or you can browse through our top belly sleeper picks here). Everyone’s body is unique and experiences firmness differently. If, after you have received your new mattress, you feel like you have chosen the wrong comfort level, the company will work with you for 100-days to swap out layers until you find the perfect fit. In general, foam beds perform better in this category than innerspring mattresses, and memory beds typically score the highest. Though not as adept as traditional memory foam, the all-latex Botanical Bliss does an excellent job isolating motion. Light sleepers who share their sleep space with a partner who changes positions a lot should sleep undisturbed in this bed. Bed-in-a-box brands do not typically excel in this category, but the Botanical Bliss performs slightly better than industry expectations for all-foam mattresses. When you sit on the edge with all your weight in one spot, you can expect to compress through the comfort layer to the support foams beneath. Lying on the side, you should not experience any difference in support compared to lying in the middle. Multiple Firmness and Thickness Options – The Botanical Bliss model is available in Soft, Medium, or Medium-Firm comfort levels that are each available in three different thicknesses: 9-inch, 10-inch, and 12-inch. Customizable Firmness – Sizes Queen and above are available split, and you may specify different firmness levels on either side by placing a custom order over the phone. 100-Night Comfort Guarantee – The company offers a free consultation during the sleep trial to adjust firmness levels by swapping out layers. Trial Period – To ensure this mattress is the best possible fit, you may try it out for 100 nights or return it for a full refund. Warranty – The company offers a 25-year warranty on this product. Shipping – Free shipping through UPS is available within the contiguous U.S. Optional White Glove Delivery Service – When you place your order, you will be given a listing of independent contractors that can install your new bed on the day it arrives and carry your old mattress away for an additional fee. and GreenGuard Gold certified, which keep the air, bed, and earth clean, all while letting you rest on one of the healthiest sleep options available. * There is also a 9-inch tall and 12-inch tall version available for this model. **You may order sizes Queen, King, and California King split for an additional charge. PlushBeds Botanical Bliss latex bed is packed with natural materials from the cover to the foundation that provide a more organic sleep experience. Botanical Bliss is stacked top to bottom with some of the highest-quality latex on the market, and its top-notch comfort and durable support make it a truly great value. The naturally breathable latex is aerated for extra cooling and comfort, and the bounce and support of the foundation materials help make repositioning easy. The certified organic cotton and wool complete the package for a bed that will help keep you dry and cool. Natural latex is a worthwhile investment, and the company is dedicated to working with their customers for 100 nights to help ensure that your PlushBeds pick is the perfect fit. Your description of the construction of the Plush Beds Botanical Bliss Organic Latex mattress seems to differ from the description on the company’s website. Any explanation? Also, I’m concerned that the customer reviews on the company’s website are glowing (4.9 out of 5 stars by 300+ persons), but the recent reviews of the same mattress on Amazon are awful. I thought my long search for an organic latex mattress was over, but now I’m re-thinking this option. Hi Lisa! Thanks for pointing this out. We’ll look into it and provide some updates. Also be on the lookout for a video review from us, as we’re planning to do one in the near future, showing you how this bed works.